A TINY strip of land at the eastern end of the Mediterranean is probably the most disputed piece of territory on earth. For thousands of years it has been fought over; in the last sixty years or so, it has been the focus of international attention as rival peoples have claimed their rights to the area. From time to time there have been promising moves towards reconciliation, and bitter enemies have signed cease-fires and peace treaties – yet the state of tension and unrest has continued. The parties which are directly at odds with each other in this dispute are the Israelis and the Palestinians. Each side provokes the other: Palestinians, often with the backing of other Arab states and political movements, have launched rockets into Israel, undertaken suicide bombings, and promoted unrest among Israeli Arabs. Israel, with the backing of the United States and international Jewish groups, has conducted heavy reprisals, and pushed ahead with its policy of building Jewish settlements on land claimed by the Palestinians. Serious-minded people are concerned about the worsening situation and its implications for Middle East stability. In this booklet we shall first attempt to define the Palestinian Question and then look at what the Bible has to say which bears on the conflict. We hope to show that the answer to the question Whose Land? is not to be found by trying to assess today’s claims and counter-claims, but by opening the Bible and examining the ancient promises and prophecies given by God Himself. On the cover of this booklet is a map of the Middle East with a wedge-shaped area coloured in red: this area is the one under dispute. From the establishment of the modern State of Israel in 1948, up to 1967, Israel represented about three-quarters of the area; the remaining one-quarter being made up of the West Bank – occupied by the Kingdom of Jordan – and the Gaza Strip, under Egyptian jurisdiction (see map on page 3). In the Six-Day War of 1967, Israel occupied the Gaza Strip and the West Bank, including Old Jerusalem. Ever since, the Palestinians, many of whom lived in these areas, have been pressing for Israel to relinquish control and agree to the setting up of a separate Palestinian state. International negotiations led Israel in 1994/5 to grant self-rule over certain areas which now make up the Palestinian Authority: Jericho and other West Bank towns and villages, and most of the Gaza Strip. In ‘land for peace’ deals Israel agreed to a gradual handover of control of these areas to the Palestinians, and the Gaza Strip was completely evacuated by Israel in 2005. The Palestinians, backed by the wider Arab world, are however not content with this gradual process and have become ever more insistent on their rights to the land – in fact, it is no secret that they want the whole area, and Jerusalem as their capital. Internationally agreed proposals for Arab-Palestinian independence have, however, more than once been refused: it happened in 1947 prior to the setting up of the state of Israel, and it happened in 1999 when Yasser Arafat, then PA Chairman, rejected an offer that would have paved the way for a fully fledged Palestinian State. The situation, as we write, is at an impasse. Israel, although it has citizens from other ethnic and religious groups, is a largely Jewish state: of a total population of 7.4 million, just over 5.5 million are Jews. Jews all over the world claim that their rights to the area – in fact an area extending well beyond the present boundaries – date back at least 4,000 years to the time when their forebears, the descendants of Abraham, Isaac and Jacob, first lived there. We shall have more to say about this, on the basis of what is recorded in the Bible. The Palestinians  also claim a longstanding connection with the area. They point out that the Arabs are also descended from Abraham but through Ishmael, Esau and others: they are, in origin, cousins to the Jews. Those who live today in the disputed areas of the West Bank and Gaza Strip claim an equal right to the land on the basis of descent from Abraham; but they also base their claim on centuries of occupation of the land, and argue that the Jews for whom the Israeli state was established are more recent immigrants – with less claim to live there. These are claims which need closer investigation. There is no dispute about the fact that at the beginning of the 1st century AD, in the time of Jesus Christ, Palestine was populated by Jews. The Land was under Roman rule. Eventually, however, the Jews rebelled to such an extent that the Romans besieged Jerusalem; in AD 70 the temple was destroyed; thousands of Jews perished and most of the rest were banished – migrating to all points of the compass. Yet, in spite of the Roman expulsions, some Jews remained in the Land, particularly in Galilee, and continued their Jewish way of life. As the centuries passed, more and more migrated back. In ‘the four holy cities of Judaism’ – Jerusalem, Hebron, Tiberias and Safed – there has been continuous Jewish settlement since Biblical times. As successive conquerors came and went – Byzantines, Arabs, Crusaders, Mamelukes, Ottomans, British – those Jews, sometimes tolerated, often persecuted, survived. Throughout most of this period, from the 1st to the 19th centuries AD, the Land was largely desolate. Palestine was, in fact, not a country as such; and there was no such thing as a Palestinian people. Arabs and Jews simply lived alongside each other, generally at peace. In view of the current situation, which involves so much antagonism between Muslims and Jews, we are bound to ask what effect the rise of Islam (the Muslim religion) had in the 7th century AD. Initially, Jews continued to have reasonably good relations with Arabs – many Jews in fact lived and prospered in Muslim lands, including Arabia. At some stage, the prophet Muhammad had said, “Two religions may not dwell together on the Arabian Peninsula”; and there are passages in the Koran which incite Muslims to rise up against Jews. Nevertheless, for nearly 1,300 years, Jews and Arabs in the Middle East tolerated one another. During the same period, it has to be said that Jews suffered more at the hands of so-called “Christians”, particularly during the Crusades. After the First World War, the League of Nations appointed Britain as the Mandatory Power for Palestine – and by the term “Palestine” they meant, not just the area west of the Jordan but a much more extensive region, from the Mediterranean to Arabia and present-day Iraq, and from Egypt to Lebanon and Syria. In 1921, however, Britain – in a gesture designed to win Arab favour – gave the territory east of the Jordan (initially called Transjordan) to Sheikh Abdullah. Subsequently this was to become the Kingdom of Jordan. Jordan also gained the West Bank, so that the territory which, in 1948, finally became the State of Israel was a small fraction of the originally intended Jewish homeland. These developments led to a highly significant change in the use of the terms “Palestine” and “Palestinians”. Up to then, “Palestinians”, in the eyes of most people, would have been Jews, or perhaps Jews and Arabs, living in the Land. From now on, and especially when a Jewish state was established called Israel, “Palestine” came to be used exclusively in connection with non-Jews. Moreover, at least up to 1948 when the State of Israel was proclaimed, Jordanian rulers (and others) were content to see the territory east of the Jordan as the obvious homeland for Arab Palestinians. That solution, however, has since been rejected – with the consequences we see today. Continuing with the history of the Land after World War One, the migration of Jews to the mandated area gathered pace; so did the influx of non-Jewish peoples, including Arabs, from other countries. To begin with, the various groups worked together, co-operating in the development of agriculture and industry and sharing in the prosperity. Sadly, and not unexpectedly, tension did eventually surface; and by the time proposals were being made for the formal establishment of a Jewish state, serious conflict began. When the British left in 1948, there was all-out war between Jews and Arabs, and the decades which followed have seen successive outbreaks of hostility. Christadelphians do not take sides in the Arab-Israeli dispute, nor do we wish in this booklet to promote political views. We are, however, bound to take notice of evidence that not all the arguments of the Palestinians are well founded. Independent research shows that not all of those at present in the towns and villages of the Occupied Territories, or in the refugee camps of Gaza and the West Bank, can legitimately claim a centuries-old association with the soil of Palestine. There is clear documentation that many are from families who came to Palestine during the period of the British Mandate, between World Wars One and Two, or even more recently; they were mostly economic migrants – and not just Arabs, but speaking (it is said) up to 50 different languages. There were indeed a few hundred thousand people dispossessed from their properties in what is now Israel – but certainly not the whole Palestinian population, as is often implied. Israelis would in any case point out that a great number of Jews were dispossessed from Arab lands, in which their forebears had lived for centuries. Sadly, tragically, war and calamity have displaced countless groups of people all over the world: the joy of the Christian Gospel is that all who will follow Christ, whatever they may have suffered in this age, are offered an earthly kingdom of permanence and peace. More important, however, than arguments over politics or statistics are the facts that we can find in God’s written word, the Bible. By turning back the pages of history, recorded in the scriptures, we can find encouragement for both Jews and Arabs – and the Bible is the only place where these things are recorded. It should be mentioned that although Arabs have their own Muslim holy book, the Koran, they acknowledge most of what is recorded in the early books of the Jewish scriptures, which are very much older. Abraham has been mentioned in connection with both Israel and the Palestinians: both Arabs and Jews share Abraham as their forefather. They are both Semitic peoples, that is to say, descended from Shem, the eldest son of Noah. After the great Flood, Noah’s descendants were dispersed into all parts of the earth. The extent of this promised possession was marked out in Genesis 15:18-21: “From the river of Egypt (in the south) to the great river, the River Euphrates” (in the north-east). God gave Esau a possession in the dry, red deserts of Edom, down by the Dead Sea (Deuteronomy 2:5). Abraham and Isaac had settled in the land of promise and he had sent his other sons “eastward … to the country of the east” (Genesis 25:6). Midian’s children became desert caravanners, and Sheba and Dedan occupied southern Arabia. From Abraham’s nephew Lot came the Ammonites and Moabites who inhabited the land east of the river Jordan. Thus we get an overall picture of a divided family: on the one hand, Isaac, Jacob and the twelve tribes of Israel (the name which God later gave to Jacob) eventually being established in the promised territory and, on the other, the Arab sons and families moving eastward and southward away from the “promised land”. The Bible is very clear that the “children of Israel”, the Jews, were the divinely appointed inhabitants of the Land. After a period in Egypt, the migration referred to as the Exodus, under the leadership of Moses and Joshua, brought them back as an organised nation, with God’s law given to them at Sinai, to inhabit the Land. Israel’s inheritance of the Land was always (and still is) subject to His people remaining obedient to Him. The Bible’s Old Testament presents the history of loyalty alternating with faithlessness. There were further periods of harassment by their neighbours, and exile. Yet, even then, and despite their faltering faith, God remembered His promises and brought them back. It was 500 years after the return from exile in Babylon that Jesus came into the world – the long promised Jewish Messiah. The Jews of the time flocked to listen to him and benefit from his miraculous powers; yet few in the end accepted him, and once again their fate was to suffer persecution and dispersion. The Romans besieged their holy city, Jerusalem, and Jews were driven into almost every country of the world. They were destined to wander – though not for ever. Had God cast away the Jews? Was their rejection of the Messiah the end of God’s plan with His once-chosen people? Many maintain that this is so, and that the God of Israel has no further purpose with the Jews – that Christians and not Jews are now the focus for the outworking of God’s promises for the future. It is true that God’s purpose is with those who believe and obey Him, of whatever race; nevertheless, God has not forsaken His chosen people, the Jews. The repatriation of Israel is a very notable sign to the world that God is in control: He is in control of all world events, but in particular He has controlled the destiny of the peoples of the Middle East – Jews and Arabs – in accordance with His ancient promises. What is happening in the Middle East is part of the outworking of God’s determined purpose, and the present terror and tragedy will culminate, finally, in events which will usher in the kingdom of God and of Christ His Son. For it is through Jesus Christ, the Son of God, the particular “seed” of Abraham, the promised Messiah, and through him alone, that there is hope. This is not the place to go into detail about the work of Jesus Christ, and the meaning of his death and resurrection, or the expectation of his coming again soon, to rule as king over God’s universal kingdom – other pamphlets are available which deal with these themes. After 2,000 or more years of man’s misrule, Jesus Christ will re-establish God’s kingdom, first of all on the territory promised to Abraham and his descendants, and ultimately throughout the world. A rebuilt Jerusalem will be its capital, the centre of worship for the whole world, “a house of prayer for all nations” (Isaiah 56:7). This is the true Christian hope: this is what the Bible teaches. Most Jews today have no interest in these things; many no longer believe in God, and very few acknowledge Christ; yet the Bible (again both Old and New Testaments) foretells a conversion of at least some of the Jews, who will look on him whom they pierced and mourn (Zechariah 12:10). “The Deliverer will come out of Zion, and he will turn away ungodliness from Jacob” (Isaiah 59:20; Romans 11:26). God is looking for those – whether Jew or Gentile – who believe in Jesus Christ His Son; and in the end, “there is neither Jew nor Greek, there is neither slave nor free, there is neither male nor female; for you are all one in Christ Jesus. And if you are Christ’s, then you are Abraham’s seed, and heirs according to the promise” (Galatians 3:28,29). Will God ignore Ishmael? We have referred to the promises made to Ishmael’s descendants: “I have blessed him, and will make him fruitful … I will make of him a great nation” (Genesis 17:20). Much of this has been fulfilled already: the Arabs have been prosperous and become a great multitude, contributing much to world culture. What hope is in store for them in the future? Harmony and peace will, at last, come to the whole family of Abraham. The Middle East will be gloriously transformed and become the centre of God’s kingdom upon earth. 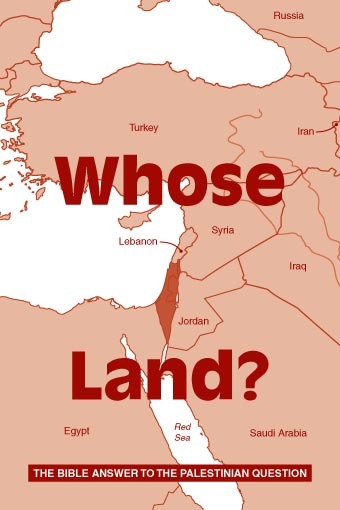 Whose Land? To those involved in the current dispute over Palestine, this is a vexed question about which the two sides feel very intensely. There is anger and frustration among both Israelis and Palestinians today – and little sign of a solution that both will accept. By looking at what the Bible says, and seeing the enmity of Arabs and Jews in the longer perspective of God’s purpose, we have tried to show that there is an answer to the Palestinian Question, an answer which will be to the benefit of both Jews and Arabs – if they believe in Jesus Christ. In the context of God’s eternal purpose, the ownership of the ‘Land’ today is actually of less importance. What really matters is who will inherit, not just this strip of land, but God’s kingdom to be set up on earth. This is a kingdom for those who “desire a better country” (Hebrews 11:14-16). For them, God has prepared His kingdom – and Christadelphians are convinced it will not be very long before this is established. If you wish to be a part of that kingdom, think about these things now, and take the necessary steps to associate yourself with the Lord Jesus Christ. In 1967, Israel also annexed a region to the north-east of the Sea of Galilee (part of Syria) called the Golan Heights. The Sinai peninsula was also taken, but later handed back to Egypt. “Palestine” has been a name associated with the coastal part of the red-coloured area on the cover map since AD 135, and is derived from ‘Philistine’, the name of a tribe who lived in this area in ancient times. In adopting this name, the Palestinians do not, however, suggest that they are descended from the Philistines, who were a non-Arab, non-Abrahamic people.